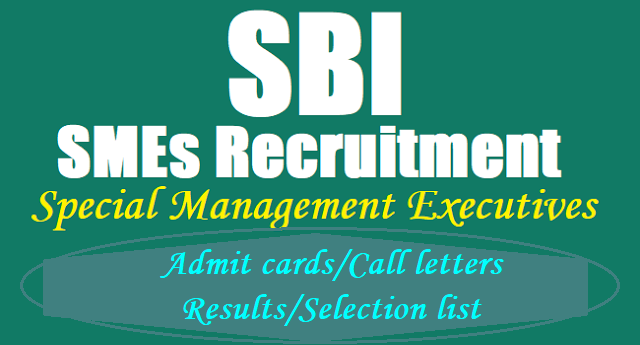 SBI management executives recruitment 2017 Admit cards issued, download/ SBI management executives recruitment 2017 call letters issued, download : The State Bank of India (SBI) has released the admit cards or call letters for the online examination for the recruitment of special management executive (SME) in scale II and III on its official website. The state-run bank has also released a booklet about the exam, which can be downloaded by clicking link below. After downloading the admit card, candidates must note their roll number, registration number, date, time and venue for the exam given in the call letter. They should reach the exam hall in time. Selection process: Candidates will be selected on the basis of an online objective test, group exercise and/or interview. The qualifying marks in group exercise and/or interview will be as decided by the bank. However, the bank reserves the right to shift the selection procedure to short listing and group exercise and/or interview depending on the number of applications received. Final selection: Candidates will have to qualify in both the online test and group exercise and interview separately. Marks secured by the candidates in the online exam will be normalised to out of 75 and marks secured in group exercise and/or interview will be normalised to out of 25.